Acupuncture stimulates the production of the body’s own painkillers (e.g., endorphins and enkephalins). It is used to interrupt the pain cycle and promote healing of injuries and chronic pain. Dry needling of your painful areas can interrupt the pain cycle, release tight, knotted tissues, promote blood flow through the damaged area, and allow healing of the tissues to occur. Electric stimulation of the needles helps interrupt the pain signals. Acupuncture is safe and effective. Often patients feel significant relief after one treatment. 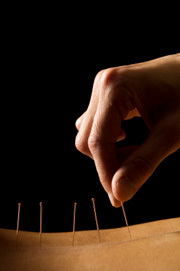 Is dry needling the same as acupuncture? How does it work? And who needs it? Good questions! Dry needling can be utilized instead of injections of cortisone. Cortisone weakens tendons and leaves them vulnerable to further tearing and damage. Research shows us that just the needling of the tissue is very effective at interrupting pain and promoting improved circulation. Only in circumstances when this approach is ineffective should shots of cortisone be considered. Dr. Smith has been using Dry Needling in addition to Acupuncture for over 20 years. She received her certification in Acupuncture in 1993.